Timber is probably man's oldest building material, with a huge variety of form, and it remains an important material both in domestic and commercial construction. 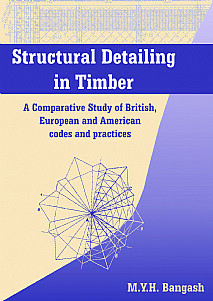 This manual provides a step-by-step approach to the detailing of timber, and deals with codes of practice from the UK, Europe, America and Russia. The manual provides practical and up-to-date information on various aspects of timber construction and covers the fundamentals of drawing and drafting practices, connections and fastening and structural detailing of various timber elements. The types of structures covered represent the bulk of the typical fabricator's work in timber structures such as buildings, bridges, grid-works, shells, folded plates etc. Some examples of timber detailing in CAD form are also included. The book is liberally illustrated with line drawings and many detailing sheets, the latter linked to international codes of practice. Preface. Acknowledgements. Metric Conversion. Introduction; Standard Specifications for Timber and Timber Connections; Timber Design Calculations - a Comparative Study of Codes; Data on Timber Fastening and Joints; Structural Detailing of Timber Joints and Components; Roofs and Roofing Elements; Timber Structures - Case Studies. Bibliography. Codes of Practice. This book will serve as the primary information and reference source for educators, designers, draughtsmen, detailers, fabricators and anyone with an interest in structural timber, whether an experienced engineer or a trainee detailer. Engineers, architects, surveyors, and contractors will find the book useful for daily practice and reference.